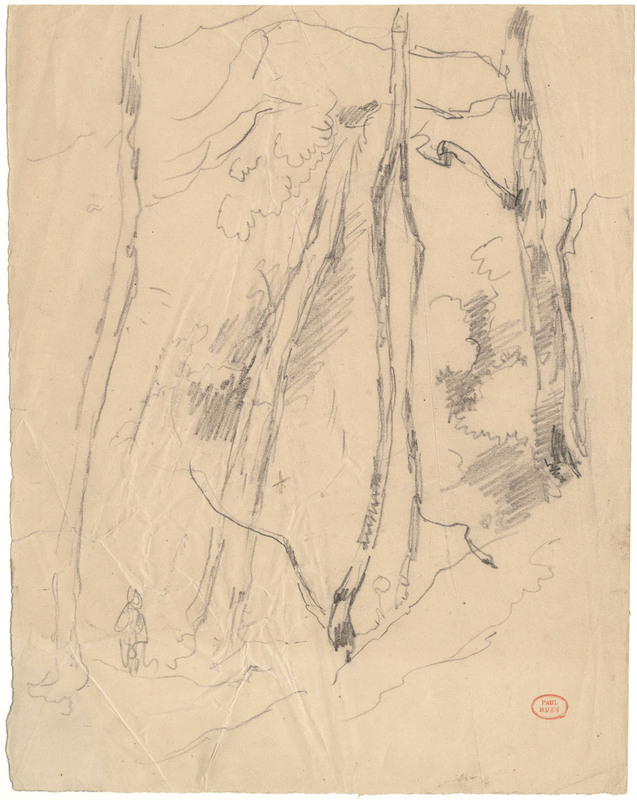 "Forest Study", undated, but the drawing was most likely executed in Huet’s early maturity as an artist. 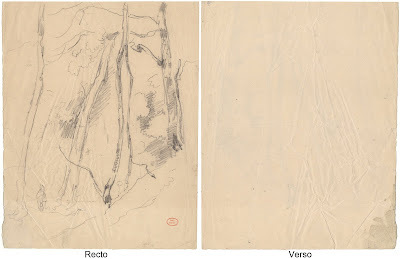 Pencil on cream wove paper, from the collection of a descendant of the artist and stamped (lower right) with the studio estate stamp. Size: (sheet) 27.8 cm x 21.8 cm. 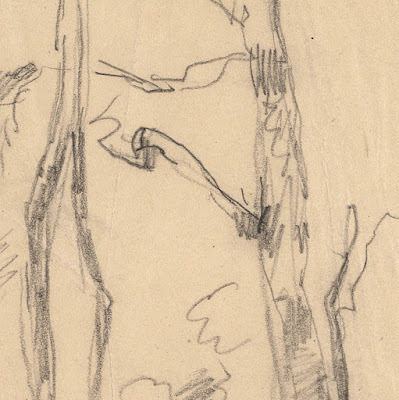 Condition: a freely drawn study in pencil on lightly wrinkled paper, unsigned but authenticated with the artist's estate stamp. I am selling this small and freely executed study of a forest with a schematically drawn figure for AU$348 (currently US$256.97/EUR235.35/GBP19944 at the time of posting this listing) including postage and handling to anywhere in the world. If you are interested in purchasing this original drawing by Paul Huet epitomising the spirit of the Barbizon School, please contact me (oz_jim@printsandprinciples.com) and I will send you a PayPal invoice to make your payment easy. 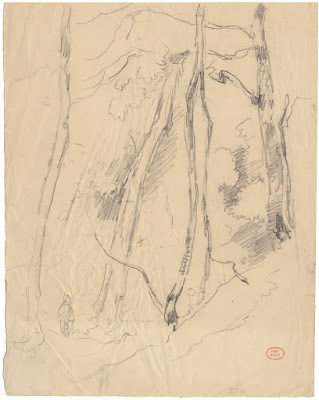 Clearly this is a quick sketch by Huet executed while he was wandering through a forest. 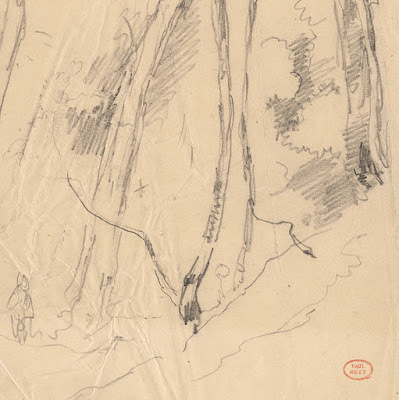 From my reading of the drawing, it shows Huet's close observation of natural phenomena, such as the unpredictable way that tree limbs "spring" from their trunks and the random spatial arrangement of the trees. My reason to point out these seemingly obvious observations is that Huet was heavily influenced by John Constable who, of course, is famous for his studies of natural phenomena, such as clouds. 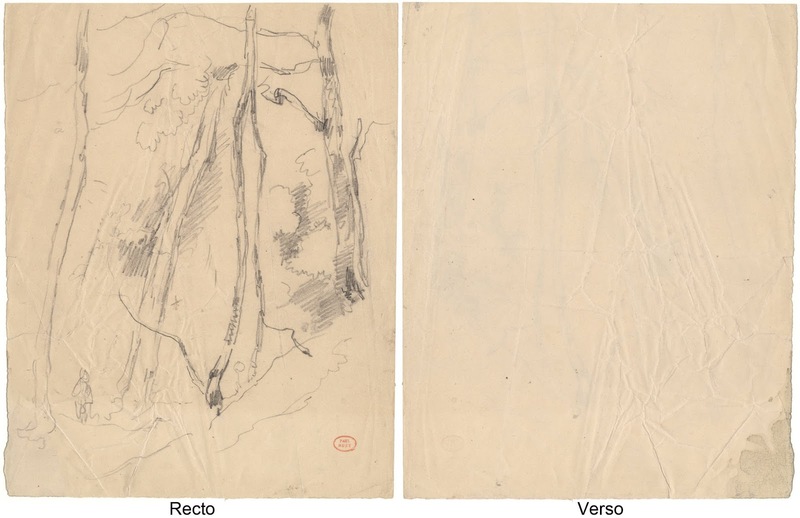 The drawing also fits well with the drawings of Richard Parkes Bonnington with whom Huet often went on outdoor drawing excursions to escape the confines of their studio-based master of grand history pieces, Antoine-Jean Gros.